I’ve mentioned a couple of times that many of the places that I’ve visited on this trip are smaller in reality than they appear to be on film or in photographs. The Grand Canyon is just the opposite. Pictures cannot begin to convey how enormous and spectacular this place is in reality. In fact, it almost doesn’t look real, as if your mind can’t quite wrap itself around the fact that this awesome spectacle is sitting there right before your eyes. Like I said yesterday, Kingman was a major disappointment. I rode back towards town on Route 66 just to make sure that I didn’t miss anything. Nothing. Just modern motels, gas stations, restaurants and the like. There were a few period motels still standing, but there was nothing noteworthy about them. Even in Portland we have better roadside attractions on Hwy 99 like The Alibi or The Bomber. I took off on Route 66 headed roughly northeast. This portion of Route 66 is the longest surviving section of the old highway which wasn’t overlaid by Interstate 40. But again, there’s nothing there. If you’re thinking about ever driving this section of Route 66 expecting to see all of this long-forgotten roadside attractions and memorabilia, forget it. There’s (practically) nothing there. I was especially disappointed by the town of Peach Springs. This is the analog to the town of Radiator Springs from the movie Cars, so I was hoping that there would be something there worth seeing. But no, nothing. In the town of Hackberry, there is an old gas station which has collected a lot of memorabilia from the pre-Interstate era, and has turned itself into a combination museum/gift shop. A few miles east of Hackberry is an old, run-down motel which has a space theme, but its out of business. The Wigwam Motel in Holbrook, which I mentioned a few days ago. Seligmann, Arizona came the closest to meeting my expectations. There were a bunch of old motels, restaurants, gift shops and so on which all still in business or were in the process of being restored. Especially interesting here was the Snow Cap drive-in. I had lunch here and took lots of pictures, which will get posted one of these days. The bottom line is that your best bet for seeing anything like what was in Cars is to just cruise along I-40, and get off at the “Business Loop” exits for all these towns along the way. These are were the old highway runs through the middle of the town, and there you have the best chance of seeing something interesting. The ultimate destination for today was to get to the Grand Canyon. After Seligmann, I got onto I-40 heading east, and exited at Williams, AZ and headed north on Hwy 64/180 to the town of Tusayan. Every major National Park has a town like Tusayan located just outside the border of the park, which has cheap motels, gas stations, fast food restaurants and the like. West Yellowstone is just like it. They exist because inside the Park itself, everything is controlled by the Park Service who strictly limit what can be done within the park. There are usually hotels and stores, but they are monopolies within the park and the prices are pretty high. I choose to spend the night at the Red Feather motel in Tusayan. When I checked in, I found that housekeeping had failed to clean the bathroom in my room. So I called the front desk, expecting to be moved to another room. And sure enough, I was. But, instead of getting another basic room like the one I paid for, they gave me The Suite. This was the biggest room in the motel; I could tell that from the map of the motel. It was pretty nice, so I resolved to spend as much time in it as possible. Which turned out to be not all that much time. After all, the whole point of being here was to see the Grand Canyon. So I unloaded the Vespa, changed my clothes, and headed into the park to see the canyon at sunset. I was there for a couple of hours as the sun when down, and I came back the next morning to see the rest of what I didn’t see today. I’ll have a separate write-up covering both days for tomorrow. Stay tuned. The plan for Day Twenty-One is to first, have a leisurely morning in The Suite until checkout time, then back to the South Rim of the Grand Canyon for some more photos and viewing. Sometime in mid-afternoon, I’ll head out of the Park to the east and then north towards Utah. Shooting to spend the night in Page, AZ in Glen Canyon. It was a nice evening yesterday, so I decided to ride out to Gila Bend at dusk in order to see the Sonoran Desert National Monument the next morning. The big attraction in the Sonoran Desert is the iconic Saguaro Cactus. These are the gigantic, tree-like cactus which are the symbol of the state of Arizona, and in many respects, of the West itself. As I was riding down Hwy 238—which bisects the National Monument—after dark, I saw these things looking up on either side of me. There wasn’t much light, but I could tell what they were. 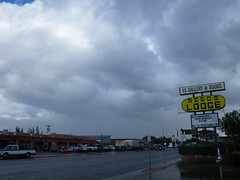 I spent the night in a cheesy motel in Gila Bend, Arizona, and got up the next morning and headed back the way I came. This time I could see the cactus, and they were amazing. I took lots of pictures which I’ll post one of these days. But trust me, they were amazing. I got back to Chandler at mid-morning, and headed up the freeway towards Phoenix itself. I pulled off at Tempe to check out Arizona State University. I rode through downtown Phoenix and took some picture of Chase Field where the Diamondbacks play baseball. And as I headed out of town towards the northwest, I tooks some pictures of the University of Phoenix stadium where the Cardinals play football. Phoenix and its surrounding suburbs is a weird place. Everything is completely flat, and all the streets run in straight lines. Its hard to tell where one town stops and another starts. Its a lot like Silicon Valley, except that there are absolutely no landmarks to tell where you are. At least in Silicon Valley, the communities all had their individual personalities before they all ran together. Around Phoenix, there’s virtually no distinction between Chandler or Mesa or Tempe. I left Phoenix on Hwy 60, headed northwest towards Kingman, Arizona. Due to time constraints, I had decided to cut the stop in Lake Havasu City to see London Bridge. Hwy 60 is pretty desolate, but about halfway to Kingman, all of a sudden I was in a virtual forest of Joshua Trees. These are kind of a cross between cactus and trees. They have wooden trunks and branches like trees, but their leaves are spiny and stiff like cactus. I got into Kingman right after dark. Route 66 runs through Kingman. As I rode down it after arriving, I was expecting to find a lot of the old attractions and establishments either still intact or being restored. But there was nothing of the sort. It was pretty disappointing. It was just like the main drag in any other town or city. Nothing unique about it. I spent the night at a Comfort Inn. Tomorrow I ride what’s left of Route 66, hoping to find something resembling the old road. I slept in late this morning because there was no need to get up early. The agenda for today was to get the Vespa serviced and back in top condition. I’ve traveled over 3000 miles since starting this trip, and it was time to get the oil changed and some other things. The local Vespa dealer didn’t open until 10am, so no need to get up at the crack of dawn. I ended up spending the better part of the day hanging around Chandler Vespa. Since I was an unscheduled job, they had to work me in whenever they could, so it took quite a bit of time. I finally got out of there late in the afternoon, but by then it was too late to continue the journey for the day, so I decided to bag it until tomorrow. The plan for tomorrow is to head down to the Sonoran Desert National Monument for a look at the giant cactus, then head to the northwest for Kingman and Route 66. Since I’m several days behind schedule, I’m probably going to cut a few destinations from the trip. The first one to go will probably be Lake Havasu City, so no London Bridge. I’m finding that I’m more and more tired as the Adventure continues, and its harder and harder to write these posts every night. I’m several days behind as it is. My son Erik wrote to ask if I had done any videos yet, but sadly no. They just take too long to put together. I’ll try to get caught up on the posts and the photos, and maybe I can finish 1 video to make my son happy. But right now, I can barely keep my eyes open. Today is Tombstone day, but here’s the problem: Tombstone is only about 20 minutes south of here. They do a re-enactment of the gunfight everyday at 2pm. So what to do until then? Ride around, I guess. Tombstone sits in a valley bordered by mountain ranges which run roughly north-south, funneling everything to and from Mexico. Tombstone is reached from Benson via State Highway 80. Also leaving from Benson is Highway 90, which runs down the right side of the valley. So I decided to make a loop down to the Mexican border, and catch Tombstone on the way back in the afternoon. A little way down Hwy 90 is Kartchner Caverns State Park. This is a recently discovered cave system which is one of the only publicly accessible wet cave systems in the world. Most caves that you see are dry caves such as Ape Cave on the southern slope of Mt. St. Helens, or Lava River Cave over south of Bend. But Kartchner Caverns is a limestone cave in which water is still flowing through and scuplting the cave. I looked around the visitors center and it looks pretty cool. I didn’t have time to go in because it would have taken most of the day. They only allow visitors in on guided tours, the the tours take several hours and cost mucho dinero. So, have to come back to this one some other time. Further down the valley is Fort Huachuca. Looking on the map, I had assumed that it was some kind of old fort which had been restored and turned into an attraction. But no, its an active duty US Army base. It may also be a historical fort, but its still in operation. I presume that its here to guard the border with Mexico, although that seems a little pointless. I don’t recall the last time we were threatened with a land invasion from Mexico, but I’m pretty sure that it hasn’t been an issue since the Mexican-American War. Further down the valley, almost to the border itself, is a memorial to Fernando Coronado, the Spaniard who first explored this part of the continent. I’m not sure why they put it here, at the end of a 5-mile gravel road. Its pretty inaccessible, although it is right at the foothills of one of the mountain ranges I mentioned earlier. It looks like a jumping-off point for exploring the mountains. One interesting thing about the memorial is that there are signs all along the roads warning you about smugglers and illegal immigrants. I saw Border Patrol SUVs going up and down the road several times while I was there. The highway turns left at this point, and runs parallel to the border for about 10-20 miles. There are places where you can see the border off in the distance. Its a clear-cut swatch of land about 50 yards wide that runs in a straight line across the landscape. There is no correlation between the border and the geography of the land. Its just a line on the map. Just for grins, I went down to a border town called Naco. The Arizona part of the town is unincorporated and pretty much a cross between a slum and a ghost town. The real town is across the border in Naco, Sonora. I went to the old border crossing and peeked across into Mexico and took some pictures. The Mexican side looked like a pretty cool little town, but I don’t have a passport so I didn’t go over. The actual border crossing area is kind of interesting, and quite a study in contrasts. Over on the Mexican side, there is a guard post that looks pretty much like a tollbooth, and it looked to be manned by only 1 or 2 border guards. The few cars that I saw cross into Mexico basically just drove across, briefly spoke to the guard, and went on their way. Coming back the other way into the US is quite another story. There is a multilane “toll plaza” kind of structure, except that there is a series of concrete obstacles that you have to zigzag through in order to proceed. There is a whole army of border guards who are checking each vehicle. There must have been about 20 cars and trucks lined up waiting to get into the US, and it looked like it took about 15-20 minutes to get through the border check. A little further north, on the highway back up to Tombstone, I ran into a Border Patrol checkpoint. Here they had blocked the highway northbound, and were questioning and checking every vehicle that came through. They just waved me through, so I don’t know what they were looking for, or what would trigger a more thorough questioning. Heading back north from Naco, the road leads up into the hills, and in a ravine is the town of Bisbee. Also nearby is an open-pit copper mine, much smaller than the one up at Morenci, but of the same type. Bisbee is yet another of the little mining towns that dot the area, but this one actually grew into quite a metropolis. The mines here turned out to be much more productive and long-lasting than the others nearby. At one time, Bisbee was the largest city (by population) between the West Coast and the Mississippi River. When the mines began to play out, Bisbee became home to an artist community which remains to this day. The town today still occupies the historic buildings in the ravine, but they are now galleries and cafes. This is another one of those places that I’d like come back and visit sometime. Finally rolled into Tombstone at about 1pm. The highway runs through town on Fremont Street. The old main street of the town, Allen Street, is one block over. They have a 4-block stretch of the street blocked off from traffic, and the whole thing resembles the old west version of the town. Many of the old buildings from the Wyatt Earp era are still standing, or have been rebuilt after the fires which devastated the town in 1881 and 1882. The businesses on Allen Street are mainly tourist shops. There are stagecoach tours and various townspeople dressed up in period costume lend to the atmosphere. Tombstone today is still a very small town. Tourism is the main industry. Tombstone was saved from becoming a ghost town like so many of its neighbors due to the fact that it was the county seat. And later, when the county seat was moved to Bisbee, tourism related to the OK Corral gunfight kept the town alive. The OK Corral itself no longer exists, but the gunfight didn’t happen there anyway. The OK Corral faced Allen Street, but the fight started in a vacant lot on Fremont street which was behind the OK Corral on the opposite side of the block. The vacant lot is very small, only 18-feet wide, about the size of a 1-car garage. It is bordered by a house on one side, and by Fry’s photo studio and boarding house–where Doc Holiday and Big Nose Kate lived–on the other. The fight started in this vacant lot, then spilled out onto Fremont Street. The OK Corral really had nothing to do with it. The fight as shown in the movie Tombstone with Kurt Russell and Val Kilmer is pretty accurate, other than showing the area of the fight as being much bigger than it actually was. The reenactment of the gunfight takes place in a small outdoor theater which is on the site of the old OK Corral. The reenactment itself was pretty boring for the most part. They attempt to show the causes leading up to the fight, but it isn’t that great. Some of the individual actors were pretty good. The guy who played Doc Holiday did a great job. The play lasts about 15 minutes, with the shootout itself taking about 30 seconds right at the end. Loud, but anti-climactic. Boot Hill cemetery is about a half-mile away, heading north on the highway out of town. It’s not really on a hill per se. It’s at the same level as the rest of the town, but the whole town is on a little plateau above the rest for of the countryside. The cemetery is right at the edge of the plateau, so its only a “hill” when viewed from outside of town. The graves of Billy Clanton and the McLaury’s–who were “murdered on the streets of Tombstone” by the Earls and Doc Holiday–are right were they should be. Their markers have been enhanced and preserved but still look like the originals. There are a few other noteworthy graves nearby, some with memorable sayings, but most of the graveyard is full of ordinary town citizens from the 1880’s. After leaving Tombstone, I headed back up to Interstate 10 and tried to make the best time I could to get to Phoenix. I buzzed though Tucson pretty quickly right about sundown, then did the rest of the trip after dark. The first part of the Phoenix metro area that you come to is Chandler, which is where I stopped for the night. Plan for tomorrow is to find a place to get the Vespa fixed. Day Sixteen dawned with clear blue skies, calm winds, and perfect temperatures. Time to ride! I headed south from Springerville on Highway 191, which heads up into the White Mountains and continues south hugging the far eastern side of Arizona. Apparently the White Mountains are a popular summer vacation area for people seeking to escape the heat of Phoenix. I saw lots of resorts and recreational areas as I traveled along Hwy 191, especially at the northern end just south of Springerville. As I continued further south and got higher up in the mountains, the road turned into a twisty, windy roller coaster. This part of the ride was a lot of fun, but there isn’t a lot of video or pictures to show for it because I was too busy trying to stay on the road to bother much with those. I’m glad I waited an extra day for the weather to blow over. Riding this road in high winds and rain would have been risky. A lot of the curves had no guard rails; one false move and over the edge you go. But once I got into the rhythm of braking and turning and accelerating, it was a blast! This road is called the Coronado Trail Scenic Byway because the Spanish explorer Francisco Coronado lead an expedition up this way from Mexico in search of the golden city of Cibola in 1540. He never found Cibola–because it doesn’t exist–but instead ended up crossing modern-day New Mexico, Texas, and Oklahoma, reaching eastern Kansas before returning to Mexico. As I was riding this roller coaster, I kept thinking that poor Coronado could have found an easier way. As you come out of the mountains at the southern end of the range, you encounter a MASSIVE open pit mine. This things must measure so 5-miles long (N-S) and a mile or two wide. The rode winds right through the middle of it, with fences on either side to keep visitors out. There’s one spot where you can watch these huge dump trucks being loaded and driven out of the pit up the side of a hill. They look like ants but when you are right beside them you realize that they are gigantic. I learned later that this is the largest copper mine in the world. I should say so. Gone are the days of the lone prospector with his wooden-shored mine and donkey-powered equipment. This is mining on an industrial scale. Passing through the company town of Morenci, I saw a train on a siding with nothing but tanker cars–at least 50 of them–full of sulfuric acid, which is used to extract the metal from low-grade ore. I wonder what happens to the waste? Continuing on, after you get out of the foothills, the highway angles off to the southwest towards the town of Safford, which is pretty much the big city in this part of the state. This area is the upper end of the Gila River valley, so its pretty well irrigated and cultivated, and here’s where I found something surprising: They grow cotton here. Lot’s of it. Pretty much all of the fields I passed on the way into Safford where planted with cotton. I’d never actually seen cotton growing before with my own eyes, but there it was. In Safford, I made a little navigational boo-boo and headed off in the wrong direction for a little white. I should mention that the Magellan GPS unit that I have leaves a lot to be desired for this type of travel. Among its other flaws is that it is practically impossible to see during the day due to the color scheme that they chose to use. Lots of pastels including some which are very similar in color. If I shade it with my hand, I can read some of the information, but if I want to see everything, I have to pull off the road and find a spot out of the sunlight. There’s no way to modify the color scheme. Bad design. Anyway, I missed a turn in Safford and ended up going the wrong way for about 10 miles. A road sign told me I was headed for Phoenix. I checked the GPS and found it wanted me to make a u-turn, so I did. Got back to Safford, got on the right road, and that was that. The “right road” is still Hwy 191, which takes you directly south from Safford, and intersects Interstate 10. Getting on I-10 from this point takes you to the southwest in a loop around a mountain range, and eventually lands you in Tucson. At the bottom, or southernmost, part of the loop is the little town of Benson, which was my destination for the day. Benson is yet another of these little mining towns, all of which were founded at around the same time, 1880 give or take a few years. Benson is about 20 miles north of Tombstone, which was where I was actually headed. But I try to stay away from spending the night in these tourist towns because the jack up all the prices. Day Seventeen: Tombstone and vicinity. I had pretty much decided this last night, but once I got up in the morning and took a look outside, I decided for sure: I’m not going anywhere today. I woke up to a full-bore thunderstorm, complete with thunder, lightening, heavy rain, high winds, the works. It lasted for about a half-hour, then it cleared up for a little while, then the next storm moved in and the cycle repeated itself. By the time I had gotten showered and dressed, there had already been three of these thunder-showers moved through the area. And by the end of the day, there had been at least a dozen–if not more–repetitions of the cycle. During a sun break in the pattern, I walked down the street to a place called Java Blues. Expecting a simple, but civilized, coffee shop, instead I was greeted by a full blown cafe with a sit-down bar and lots of tables scattered around a renovated old house. There even was a full bar in the back half of the building. A lot of locals where in and out during the time that I was there. I ended up staying for both breakfast and lunch, not leaving until after 3pm in the afternoon. I tried as best I could to get caught up on my blog entries, as well as get a bunch of photos tagged and uploaded to Flickr. It’s about 10pm right now as I write this. The skies have been clear since just before dark. The wind still flares up and shakes things around a bit every once in a while. The forecast for tomorrow calls for partly cloudy with only a 10% chance of rain in the mountains where I’m going, and calm winds. So it looks like I’ll be off again tomorrow to continue with Scott’s Big Adventure.